There are few better ways to celebrate your connection with the African-American community at the time of Kwanzaa than by doing crafts. This encourages active participation in the holiday, which in turn leads to a fuller appreciation of the meaning of this non-religious holiday founded in 1966. Kwanzaa with one "a" is a Swahili word; "matunda ya kwanzaa" means "first fruits." The celebration has to do with marking the harvest, and the American celebration combines traditions from many African cultures. Dr. Maulana Karenga, professor and chairman of Black Studies at California State University, Long Beach, began the celebration in 1966 to unite African Americans after the Watts riots. 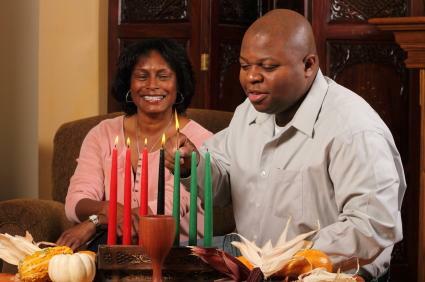 Different families celebrate Kwanzaa in different ways, but it usually includes telling stories, playing or listening to traditional music, and eating together. The centerpiece of the celebration is a candelabra holding seven candles. One candle is lit each day as the principle of the day is discussed. Now that you know a bit about the history, symbolism and meaning of the holiday, you can start thinking about what kind of crafts you want to make to celebrate. The best Kwanzaa crafts give the whole family an opportunity to get in on the fun. A pouch in the style of African tribal art can give the kids something to wear during and after Kwanzaa to carry around special, smaller-sized knick-knacks and trinkets. Using beads that are in the colors associated with Kwanzaa are one way to make this more related to the holiday. Take a half sheet of craft foam in the color of leather, and cut it into two pieces measuring 4-1/2 x 6 inches. Placing the pieces on top of one another, punch holes on the left and right side and the bottom. Sew the two pieces together using a four-foot-long piece of hemp string. Add beads on one or both sides of the pouch as you stitch over the holes. Tie the two ends together at the top. Take three small pieces of hemp and thread them through the stitching at the bottom. Add beads to the dangling string and tie them off. Paper candles are a great way to celebrate the season and make an excellent hiding place for little toys and trinkets. Cut a piece of construction paper to the same height as the roll in the center of toilet paper. Wrap the construction paper around the toilet paper roll and secure it using either glue or tape. Cut a piece of orange and a piece of yellow tissue paper to between 12 and 14 inches square. Arrange them on top of one another at a 45-degree angle. Push your finger down in the center while you gather the tissue paper up around your arms. Pull your arm out of the tissue paper. Using the eraser end of a pencil, push the center of the tissue paper down into the roll. Put some little treats inside the tissue paper. Tie off the top using a small piece of twine or string or a twisty tie. Fluff the tissue paper to form a flame. You can make one candle for each day of Kwanzaa as a charming way to hold gifts. Popsicle stick puppets are an opportunity to educate your children about the native fauna of Africa. Attach a sticker of an indigenous African animal to each side of the popsicle stick to make a cute little puppet. This an easy project that even the youngest children can enjoy. Best of all, your kids can play with these after the construction is done. Collective work, creativity, and purpose are three of the central values of Kwanzaa. You can teach your children these and other values by doing crafts with them. This will bring a unique quality to your Kwanzaa celebrations that nothing store bought can duplicate.